Showcase in curved transparent glass, 8 mm-thick, door in 6 mm-thick glass with four fest-positioned shelves in 8 mm-thick glass. Base in 12 mm-thick extralight glass, white or black back-painted, backsilvered or extralight acid-etched. 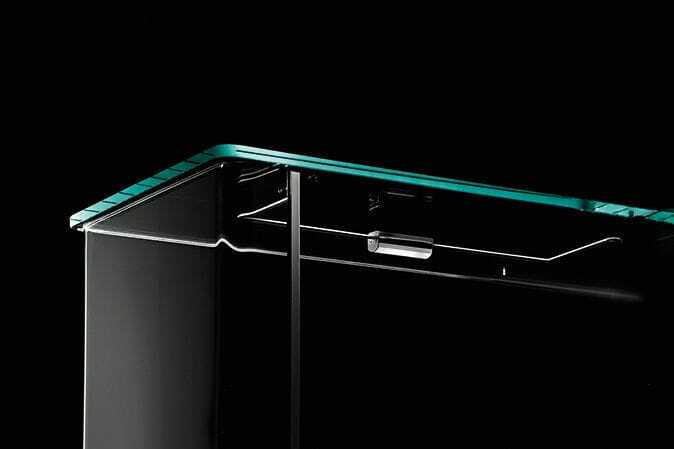 Top in 12 mm-thick glass. Profiles in brushed aluminium glossy finish. Fitted for a lighting kit. Also available with two shelves fitted with with lighting leds connected to a proper dimmer (Milo Day Led).